Previously, our Agents reported that the Kino miners had become entranced by false rumors that I had been permabanned in response to miner petitions. The rumors were exacerbated by the fact that I had not logged in for a time, but were put to rest by this blog. 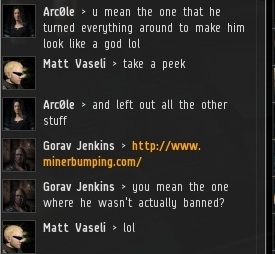 Even so, some miners still had difficulty accepting the fact that I was not banned. Guiding Kino residents to this blog is a mistake on their part, I believe. Unlike the dissident miners, who want to annihilate everyone who inconveniences them, I welcome open and honest dialogue. The vision presented by this blog offers a clear contrast. In my view, even if it is framed in a biased manner by our opponents, people will find themselves attracted to the New Order. Rather than being repulsed by the New Order, he found the Code to be reasonable. More and more, joining the New Order seemed more appealing to him than joining the miners. He even spent some time bumping miners. Gorav Jenkins then began challenging the miners and their lies. Armed with the truth, he easily overcame them in a spirited debate. Ironically, it was the rebellious miners themselves who helped pushed him closer toward the New Order. Ultimately, Gorav Jenkins chose to become a shareholder in our exciting enterprise. I would like to thank the Kino rebels for their assistance in recruiting more people to the cause. When given the choice between the New Order and AFK ice mining, I know most people will make the right call. As Sun Tzu once said, "When people see a strong horse and a weak horse, by nature, they will like the strong horse." "When people see a strong horse and a weak horse, by nature, they will like the strong horse." - NOT Sun Tzu, but Osama bin Laden. Oh your propaganda is hilarious, James. Praying no one will take the time to look up the ludicrous ramblings. Gorav supported you long before anyone showed him the site, as well. To say he didn't already know of the site or was anything but a spy to begin with just furthers your propaganda. How about you tell the people how you disappeared rather quickly once the real calvery showed up to deal with botters in a more meaningful way? 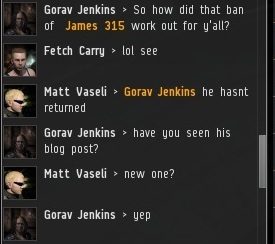 Yes, James, you poked your head in long enough today after a two day hiatus to ask if we had gankers coming to deal with botters, then mysterously disappeared when they showed up, why is that? Could it be because you know you would get ganked for that 106m bounty on your head? 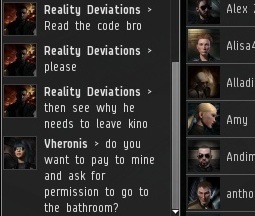 Isn't it sad someone would rather put a ten times higher than your asking fee, bounty on your head, than to pay you money for your extortion games? Gorav here. I'll put a link to this in my bio to prove it's me, but at the moment I'm not able to log in. You're right that I knew about this site before I went to Kino. That's what brought me there in the first place. I originally planned to hang out, see what sort of drama was really going on. When I arrived, I discovered just how bad the disease was. Risk averse carebearing everywhere I looked. I bumped Vheronis once, then off he went vowing revenge (that never came). At that moment I realized that something needed to be done. 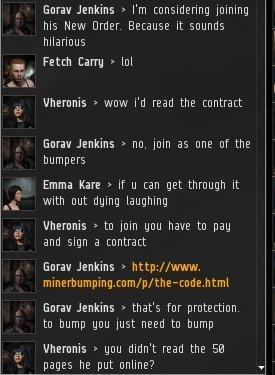 I'm not sure if I'll be able to continue my bumping career, as I'm looking at checking out lowsec. 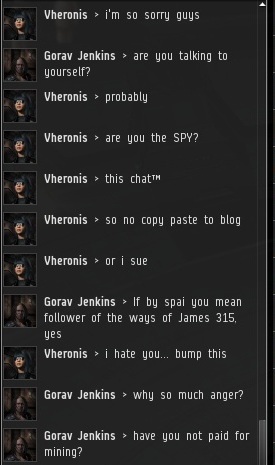 But my ISK can help fund the savior that we need, James 315. So no, the Kino miners didn't introduce me to the New Order. But their shameful behavior is what prodded me to do my part in restoring balance. Hey Gorav. I appreciate the clarification. I'll update the post with a correction. Thanks for dropping by New Order territory! Sorry, Gorav, just don't believe that, your kind words for him before hand are what gave you away. Mining is a disease? How about live and let live? You bump someone, they get angry, how is that justification for your cause? They had every right to get angry, not you. Step back and think for yourself for a second, take what this idiot has put into your head out, and do your own thinking. I would also add, that not once did we ever confirm you have been banned James, it was speculation and curious questions. We said you SHOULD be banned. So yet more propaganda is put away, none of your posts say we actually said you were banned. All we've said is you haven't returned, which led to us being curious. It's amazing how easily one can lose faith in another human being by simply reading a few forum-posts and a blog. You think AFK-mining equates to MURDER? You quote an infamous terrorist-leader for the sole purpose of justifying your actions? You're going to hell, man. I think it's much more appropriate to quote a psychotic murderous super-computer: "You are not a good person. You know that, right?" I'll be keeping an eye on you from now on. One day, you will be suicide-ganked, and podded, and I will be 106 million ISK richer. When did I ever equate AFK mining with murder? As Sun Tzu once said, "When people see a strong horse and a weak horse, by nature, they will like the strong horse." Proves you are a fool.